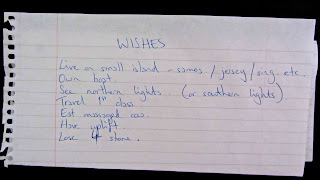 Clearing out my filing cabinet recently, I came across this list that I wrote and promptly forgot about in 2001, entitled simply ‘WISHES’. In case you can’t read my handwriting, here they are (faithfully transcribed – dreadful grammar included). Live on small island – samos / jersey / sing. etc. See northern lights. (or southern lights). Three of these things have inadvertently been crossed off and I’m still fairly keen on achieving the other four, at least for a while. I like to think I’ve grown and developed in the last 11 years but it turns out that I’m still fundamentally the same person; I’m not sure quite how to feel about this. What would I add if I wrote the same list now? Well, these past wishes seem to neatly fall into categories, each representing a specific desire in a general area of life. First is the ‘where to live’ wish. All my life I’ve wanted to live somewhere with a sweeping view. Living in a field on a slight rise I have this one nailed. The only way to improve it would be to have some water in my eye line; the sea, a river or a lake would add an extra dimension to the vastness of green stretching in every direction from my home. ‘Stuff to own’ comes next. 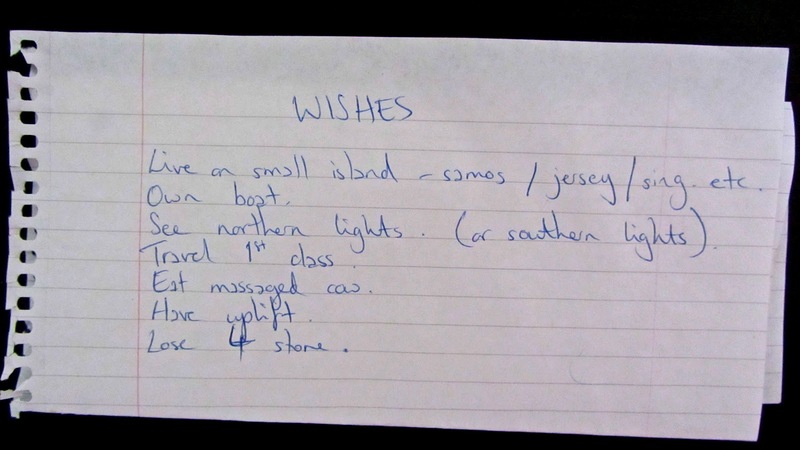 I wouldn’t say no to a boat, obviously, but actually on a list of wishes this is the only one where I’ve really nothing to add – I have everything I need already. If it were ‘stuff to have’ then honesty forces me to admit that I’d like someone to share it with, though is that something I wish for with the associated sense of pining and longing? Not really. Not yet. ‘Things to see / places to go’ is the section that I could fill pages with; South America, Great Barrier Reef, Great Wall of China, New Zealand, Vietnam, a desert island paradise, West Africa, Alaska, the list goes on, and on, and on… A shorter one would be places I have no desire to go; Casablanca (HATED it). End of list. Travelling 1st class is one that I have technically achieved, though Virgin Trains form Manchester to London isn’t really what I was thinking of when this was added, so this one can stay exactly as it is. I can’t envisage a time or situation in which this will ever be possible, so it stays. I am ever wishful. Kobe beef was an anti-climax when I finally got the opportunity to try it (though this is possibly because it will have been fake – I’d love to try it in Japan). Delicious, don’t get me wrong, but three times as delicious as the other steaks on the menu? Nope. So what ‘thing to eat’ would take its place on the wish list 2012? Anything someone else has cooked for me because they love me and they think I’ll love it. I don’t care if that sounds like a bit of a cop out – I am pretty much in a position to buy whatever I fancy to eat so it’s the intangible part of the eating experience which becomes sought after. The last two are both to do with how I look, and it’s pretty representative of my priorities at 24 that this section gets double the wishes of the others. It’s pretty representative of my acceptance of ageing that if I had to fill this slot on a wish list now it’s be something totally unattainable like having hair that doesn’t go grey or a self-maintaining bikini line. It’s interesting to me that there’s nothing on my list about my career – I was days away from starting my teacher training when I wrote this, so I guess I thought I had it all wrapped up. I’m still teaching, so my 24 year old self was probably right not to waste a wish on that one. There’s also nothing about relationships – I was two years into what would turn out to be a 13 year relationship so didn’t think that area needed help either. I guess the message is that whilst things may change on the surface, core values don’t migrate much from where our adult moral compass deposits them. I wonder if I’ll still feel the same as I ride my boat to my island? LBRG become a WFTDA Apprentice League!